When I first started doing this I had difficulty with some of the bigger ones due to the fact they were not given a proper release. Some, like Hearts of Fire, I had to purchase my own VHS copy. Some, like our film today, I could not get at all. 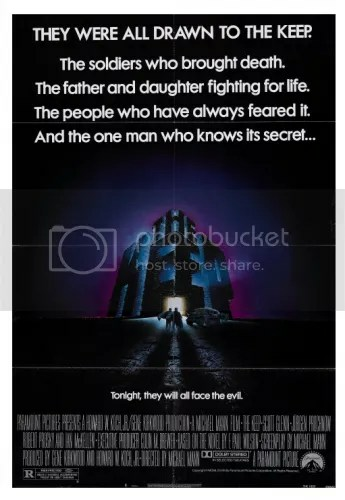 Thankfully someone transferred a television broadcast of this movie to YouTube and I had the pleasure of finally reviewing this movie. Inchon was almost entirely funded by Sun Myung Moon and the Unification Church. Why make a movie about the battle of Inchon? Well, it was apparently a choice between making a movie about Jesus or Elvis. I’m not kidding. Then a fortune teller advised Moon she spoke to MacArthur and he gave the personal go ahead for Inchon. Still not kidding. 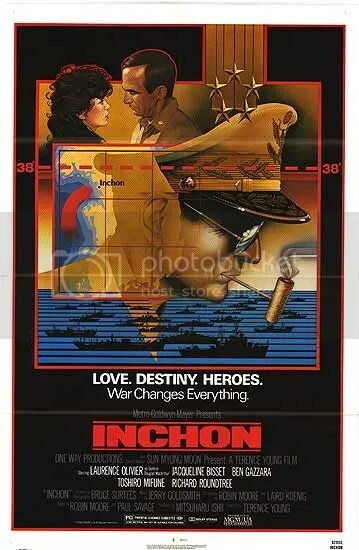 The end goal of Inchon was to be the start of a series of 10 or so movies about the Bible. I’ve already stopped trying to grasp the logic of these people and I suggest you do the same if you want to avoid a headache. So yeah, this one is big one. But I am far enough away from the film’s production to give this movie a fair shake. This is what I do after all; I cut through the irrelevant stuff and give my assessment independent of all that. One final note before proceeding, I saw the TV cut which is about 140 minutes and not the 3 hour Cannes version which I think is lost forever. I think I will start by saying this is nowhere near the worst movie I’ve seen or even the worst war movie I’ve seen. Now part of that might be helped by the cut of the movie I’ve seen and how I’ve seen it. I have heard the 3 hour cut had ludicrous scenes like a rumored scene where Jesus appears in a cloud to tell a pilot to bomb some North Koreans. This is the edited television cut where some of the worst parts are on the cutting room floor. I have also heard complaints that the special effects for the battle scenes are among the worst. Now, keep in mind I saw Inchon on a YouTube transfer of a television copy on my tiny iPhone screen. I could have been watching an Ed Wood movie and wouldn’t be able to see the strings so I will punt the ball on visual effects this time. The plot is supposed to be primarily about MacArthur but it really follows three plots. The first plot is about Maj. Hallsworth (Ben Gazzara). He is having an affair with a Korean woman while his current wife Barbara (Jacqueline Bisset) is near the northern border buying furniture (I don’t get that either). Hallsworth first is on a mission to get Barbara to safety and later in the film is leading a covert mission prior to the attack on Inchon. The second plot is about Barbara as she tries to make her way south with five Korean children. The third story is about MacArthur as he plans the attack. I realize I said this was not among the worst movies ever but that certainly doesn’t make this movie good or even slightly less bad. It really isn’t helped by the bad writing; both of the plot and the dialog. One example is when MacArthur is told he will be commander of the armed forces in Korea. He gets up from the dinner table and says matter of factly to his wife “Well, time for me to save the world again.“ It might not be so bad if we established MacArthur as having an ego the size of Jupiter or if he said that is some kind of joking tone, but it is said like he really is a superhero going to put on his tights. Crap, now I put the image of 70-something year old Olivier in tights in my head. Anyway, it doesn’t help that I don’t get to know any of these characters despite spending so much time with them. Ben Gazzara is in this love triangle but he hardly spends any time with that problem. Does he want to be with Barbara? Does he want to be with the Korean woman? I have no idea because we are given nothing to work with. Ben Gazzara seems so bored with everything going on and he goes about his mission of finding Barbara with all the emotion of someone looking for a set of lost keys. No screw that comparison. At least with lost keys there is some tension the person won’t be able to go where he/she wants to go. Ben Gazzara had a deeper love story for Jimmy in Road House then he does for either of these women. That leads into the snoozefest which is Barbara’s story line. Barbara takes five refugee children south to safety and encounters almost no resistance along the way. Thank you for wasting a third of the movie on something so incredibly boring. That leads to the befuddling plot involving MacArthur. I say befuddling because it is an odd performance for an odd character. This is a role that won Olivier a Razzie, but at the same time Olivier contends that is how the real MacArthur acted. I am not so much concerned with the voice he used as how his character is portrayed. I have perceived MacArthur much like Patton in that they are both larger than life figures. MacArthur’s persona was probably such that he would say with a straight face he was out to save the world but in Inchon we see him as a feeble old man. That is probably cause in real life Olivier was a sick man who could barely get on set. But if that is the case you shouldn’t have hired him to begin with. When he walks into a room, time should stop and he should be the focus of everyone’s attention. Instead when he is in briefings he looks like he needs nurses on either side and all the generals are looking at each other as if to ask “Who let grandpa out of the nursing home?“ They try to throw in a line here and there about MacArthur questioning whether he still has what it takes in his old age, but it never amounts to anything. MacArthur never goes through any struggles or challenges and we don’t see him really agonizing over this. I am not going to forget to mention some of the other top billed actors despite the fact the writers seemed to forget them. Richard Roundtree (Shaft) is in this movie and no he doesn’t do anything cool. He drives a jeep for people. That’s it. He drives Ben Gazzara around and then Bisset and then Gazzara again. Way to waste Shaft motherfuckers. Toshiro Mifune is in this movie and this man absolutely cannot act in English. It is simply a fact and he should not have been in this movie. David Jansen is in this movie briefly simply to deliver a few lines about how badass MacArthur is and most of his scenes were cut out of the TV version. Thanks again. Now I can’t speak to the visual effects of the battle scenes but I can speak to how the battle scenes are done overall in the movie. In the first half we aren’t really told what is going on in these battles and what is at stake. So we are seeing footage of random tanks driving around and people running places followed up by explosions of things and random people dying. I don’t know how the battles are going, what this battle means in the grand scheme, and again what the stakes are. Believe me I could go on about this movie. I could talk about how it is not historically accurate or how it only gives the pro American side of the conflict. I could ramble more about how characters don’t have arcs or this story line leads nowhere and that is dumb but you get the point. While this isn’t near the worst, this is still pretty awful. I think that speaks more to the crap I’ve seen rather than the quality of this movie. When all is said and done this movie bored me. The dialog, while crap, is not bad enough to be laughably bad, the acting is phoned in/bad, the battle scenes are poorly done and uninteresting, the characters are dull, and nothing about the writing makes me care about anything. I actually would have preferred if it was dumber because then I could recommend it in a ‘so bad its good‘ way. Instead it is the kind of bad that bores you to tears.